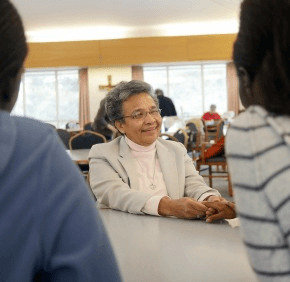 TOWSON – Multiple choice: Do Mission Helpers of the Sacred Heart (A) direct Hispanic ministry at the parish level, (B) provide a haven for immigrants fleeing persecution in their homeland, or (C) offer a gathering place for a number of institutions in the archdiocese? Answer: (D) all of the above. Founded in 1890, the Baltimore-based Mission Helpers are in the midst of a 125th anniversary that pays homage to their rich history and the various ministries they continue to offer. Their charism can be traced to a young woman organizing Sunday School for blacks on the steps of the former St. Martin, a landmark Irish parish in West Baltimore. Mary Frances Cunningham took the religious name Mother Mary Demetrias, and became the first mother superior of the Mission Helpers. According to the order’s history, they were the first religious women from the U.S. to serve in Puerto Rico and blazed faith trails in Venezuela, but their biggest impression was made in the Archdiocese of Baltimore, where they ministered at the city jail and its almshouse – and more than 150 parishes. Along the way, the Mission Helpers became known for going out among the people, rather than being tied to specific institutions. In 2008, Sister Loretta Cornell succeeded Sister Judith Waldt, a fellow Baltimore native, as president of the Mission Helpers. They count 40 members in the archdiocese, 10 residing at the Mission Helper Center off West Joppa Road. Members are encouraged to live in community elsewhere, as the Mission Helper Center has been for sale since 2012. Until a buyer comes along, the Mission Helpers will continue to open its doors, for Saturday 5 p.m. Mass and to groups ranging from deaf ministry and high school retreats to the Order of Malta and the P. Francis Murphy Justice and Peace Initiative. Less visible but perhaps most vital, the Mission Helpers also host Asylee Women Enterprises (AWE). A local secular organization supported by the Mission Helpers and seven other women’s religious communities, the four-year-old nonprofit supports women seeking asylum in the U.S. The Mission Center serves not just as a gathering place for AWE guests and their sponsors, but as the current home for five women, four from Rwanda and one from Afghanistan. These women have fled nations that have been torn by war and sectarian violence for generations. Sister Madeline Gallagher helped shepherd an Ethiopian family through that process. As they share a campus, meals and worship, do Mission Helpers try to get women seeking asylum to discuss the horrors that brought them to the U.S.? Sister Rosa Sofia Toledo recalled the excitement of the guest from Afghanistan in December. Sister Rosa, who holds a bachelor’s degree in psychology and a master’s in pastoral ministry, personifies an order whose local members can communicate in French, Spanish, Polish and American Sign Language. She joined the Mission Helpers in 1966, shortly after the order went to her native Venezuela in response to St. John XXIII’s call to evangelize Latin America. While still in her 30s, she was running a diocesan catechetical office there, which qualified her to venture out to a remote, impoverished region of the country. She and another Mission Helper began a mission that has grown into a parish and community center, which includes an industrial school, child and elder day care centers, a credit fund and food distribution center – all of which they taught villagers how to run themselves. It’s one of the success stories the Mission Helpers are sharing during their jubilee year, which will include a June 28 crab feast and conclude with an Oct. 10 Mass at the Cathedral of Mary Our Queen in Homeland, celebrated by Archbishop William E. Lori.